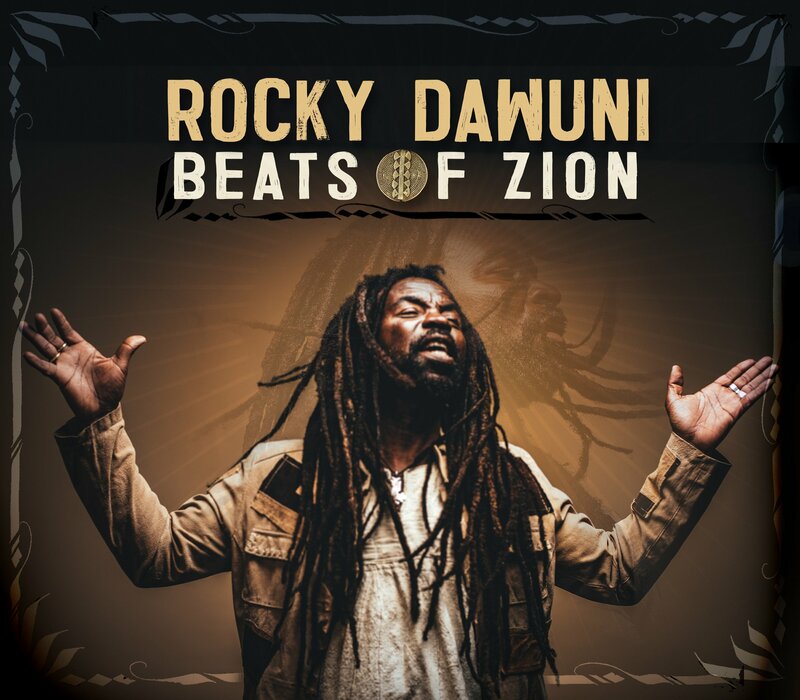 Rocky Dawuni, the international music star/global ambassador and humanitarian activist, announces the release of his highly anticipated 7thstudio album Beats of Zion, out March 8th, 2019 via Six Degrees Distribution. The thirteen-track set follows the GRAMMYnominated album Branches of the Same Tree,(“Best Reggae Album” in 2016) and expands Rocky’s “Afro Roots” sound to include the diversity of the Ghanaian music scene and its current global outreach. Although Rocky’s music has had CNNnaming him “Africa’s Top 10 global stars” and Ziggy Marleystating “Rocky’s music is creative inspiration that knows no boundaries,” it’s only one part of what drives his mass appeal. Dawuni’s eloquence, cultural diplomacy and passionate activism have led him to become a moving spokesperson for various global causes. Recently, Rocky was designated a UN Goodwill Ambassadorfor Africa at a beautiful concert at the UN Headquarters in Nairobi, Kenya in August 2018 held during the Global Landscapes Forum with dignitaries from all over the world. This is on top of the social campaigns and activism he’s done including work with Product (RED), ONE, UNICEF, The Carter Center, Clean Cooking Alliance and the United Nations Foundation. Additionally, with UNESCO’s recent designation of Reggae music as an Intangible Cultural Heritage of Humanity, Rocky Dawuni represents one of the leading African global voices of Reggae. The title track and lead single “Beats of Zion” came out well from the Village Studios session, but was missing something on the drum tracking. Rocky states, “We travelled to Zanzibar for a concert shortly after the recording session. At the time, I was still wanting the full African tribal effect that I had imagined. On the eve of my concert at the amazing Sauti za Busara Festival, we saw Batimbo Percussion Magique of Burundi mount the stage and blow the minds of everyone in the audience. I turned to my manager; Cary Sullivan who was also watching and we thought the same – ‘these are the guys for Beats of Zion’ and so the story unfolded.” The lead single will also have an accompanying video due out January 25th. “Wickedest Sound” is another song that speaks volumes, featuring Ghanaian dancehall star Stonebwoy. The track combines elements of modern Afrobeats with Reggae music. With production paying homage to the organic recordings of classic Highlife music, it also combines a groove driven melodic approach with the traditional call and response style of singing. “Kyenkyen Bi Adi Mawu” is a sprawling remake of the Highlife classic originally recorded by Ghanaian maestro K. Frimpong. This re-imagined version pays homage to Rocky’s Ghanaian legacy and he brought in an international cast of musicians from the US, Belize, Cuba, Ghana and Brazil to expand the traditional sound boundaries of this track. Ghanaian lyricist Sarkodie’s rap melds current traditional pop elements to make this song an opus of sounds, harmonies and sweet melodies. “Let’s Go” fuses pop sensibilities, Reggae and the grooves of New Orleans to create a feel good anthem of forward mobility and positive vibrations. The hand claps add an organic Gospel feel to this exhilarating song. Other tracks that show more dimensions to the album include the Cumbia inspired dancehall track “Freedom Train” featuring Argentinian Dancehall star Alika and “Burn One” that is an homage to the social transformative power of the legalization of marijuana in the spheres of medicine, recreational use and as a primary tool for economic emancipation. There will be beautiful high quality videos coming out for many of the tracks on the album including “Elevation” which was shot on location in southern India. It is an inspirational groove filled with a message of hope and uses the traditional Rastafarian Nyabinghi sounds. “Champion Arise,”a track that easily fits into the current roots reggae revival sound, paints a spiritual picture with biblical imagery and inspirational lyrics about spiritual warfare for the upliftment of all people. The diversity and features found on the new album are in step with Rocky’s vision of constantly evolving the boundaries of his sounds and expanding its global palettes and reach.